Customers are used to a streamlined shopping experience. Many enjoy online shopping from the comfort of their own home, where they can leisurely browse, select their products and pay for them immediately, only having to wait a few short business days for their arrival. Today, this seamless experience is expected not only online, but also in stores. 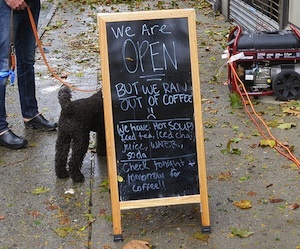 So what happens when a storefront’s point of sale (POS) system goes down? When a customer visits your store and is unable to pay as he/she normally would, the end result is an experience that’s not only undesirable, but also very costly. Some merchants attempt to work around this situation by only accepting cash when their POS system isn’t working. The result is long lines and delayed checkouts, causing many frustrated customers to walk out and never return. This also makes it very difficult to keep track of transactions and reconcile goods sold, inventory on hand, etc. Other merchants faced with this situation aren’t able to accept payments at all, resulting in substantial revenue loss. Both scenarios leave merchant’s extremely vulnerable and in dire need of a dependable business continuity solution. While it’s not every day that your POS system goes down, there are a number of circumstances that can result in service interruptions, such as extreme weather conditions. For example, during Hurricane Sandy more than 260 Darden branded restaurants, including Olive Garden, Red Lobster, Bahama Breeze and The Capital Grille, were all forced to close. Additionally, 1,000 Starbucks along the East Coast could no longer serve customers. Another business continuity risk that companies face is security breaches. In September 2012, numerous retailers experienced a major point of sale attack. The breach, which remotely compromised POS devices and systems operated by several retailers, compromised more than 146,000 cards and has been linked to more than $10 million in fraud losses. 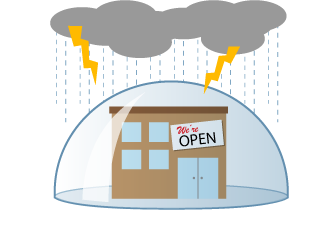 So how do you protect against these risks in order to keep your business up and running? Today, many businesses are turning to mobile POS and incorporating this technology into their business continuity plan. 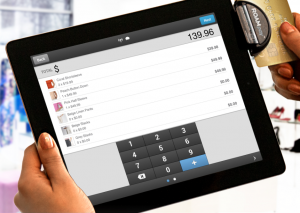 Mobile POS allows businesses and their employees to accept payments using a mobile device. Leveraging a secure mobile card reader and an mPOS application, employees can gain a sure fire way to continue accepting payments in case a store’s POS system goes down. And if the business happens to lose wireless connection, a merchant can still accept offline transactions if they’re using an advanced mPOS solution. But business continuity is more than just a back-up; it can also represent freedom and flexibility for your business. The same technology that enables business continuity can also be used to improve customer experience and increase business efficiencies. Mobile POS creates a personal connection with customers that provides almost the same level of efficiency as online shopping. When your customers find that they can visit your storefront with this same ease and convenience, while also getting the opportunity to interact with knowledgeable sales staff, they will be much more likely to become a repeat customer. Additionally, by eliminating long lines and enabling check out from anywhere in the store, customers can pay faster and obtain their product sooner. There is no denying that this is an instant gratification society and if a customer can purchase that suit as they’re trying it on or buy that mattress as they’re testing out the springs, it makes for a much more satisfying buying experience. A proven mobile POS solution provides the flexibility you need to better serve your customers and continue making sales, no matter what external forces may come your way. Now you can connect — and stay connected — during hurricanes, service interruptions, security breaches and more. And as the age old saying goes, it’s better to be safe than sorry.